Successfully Added Allcall Rio Android Phone - Quad-Core CPU, Android 7.0, 5 Inch HD Display, Dual-IMEI, 3G, OTG, 2700mAh, 8MP Dual-Camera (Black) to your Shopping Cart. With its Android 7.0 operating system, the Allcall Rio smartphone lets you enjoy the latest software feature available. If you are looking for a cheap Android phone that will treat you to a smooth and lag-free experience, this device is perfect for you. Available for less than 70 Dollars, this certainly is one of the best cheap smartphones on the market. Besides its state of the art operating system, your cell phone comes packed with a Quad-Core CPU. This processor that has been clocked at 1.3GHz brings forth a powerful performance thanks to which you’ll be able to enjoy games, movies, and more. No matter the type of smartphone user you are, the Allcall Rio is sure to meet your needs. By supporting 16GB of internal storage and a 32GB SD card slot, this cell phone packs plenty of storage for all your files and media. From now on, you’ll be able to enjoy the latest movies and games in the phone’s stunning 5-Inch display. This HD screen features IPS technology thanks to which it brings forth vivid colors and crisp detail no matter your viewing angle. Simply head out to the Play Store and download the Apps, games, and movies of your liking. With this Android phone at your side, you’ll never have to be bored again. In order to increase your mobile experience even further, it supports OTG. Thanks to this, you’ll be able to hook up external hardware devices such as a memory stick, keyboard, or game controller to your new Android phone. 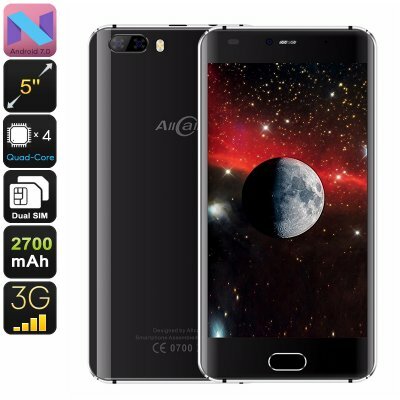 This Android smartphone supports 2 SIM card slots and Dual-IMEI numbers. Therefore, you’ll be able to stay connected to two network providers at the same time. This makes your Android phone perfect for separating work and private life or for connecting to the internet at local fares while traveling abroad. By supporting 3G, you can be assured that you’ll always be treated with fast mobile data speeds. Whether you’re at home or traveling in a foreign country, this Android phone will constantly keep you within reach to your friends, family, and loved ones.